Purchased from Lloyd Paxton, Dallas,1981. When it was sold, this bureau-cabinet was bearing the label of the firm Ferdinando Poligani from Milan and the ink inscription Fatto Nell'Anno 1864, which is now in all probability obscured by a glued lining to the interior. It is almost certainly to be the bureau-cabinet with the same label and signature illustrated in C. Payne, 19th Century European Furniture, Suffolk, 1985, p.437, pl. 1294. The firm of Ferdinando Poligani had premises at Borgo di Porta, Vittoria N.81, Milan, and flourished in the 1860-70's. 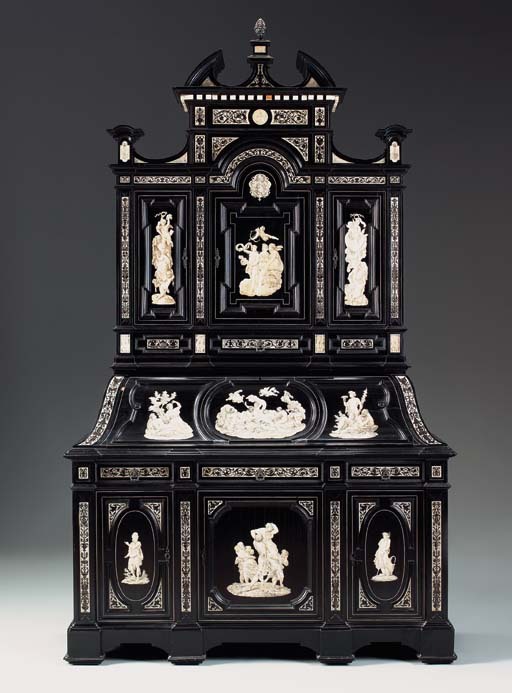 Poligani specialized in architectural pieces with a Baroque influence, often inlaid with engraved ivory figures. (See Payne, op.cit., p. 389).